Welcome to The Fleece, Hillesley. 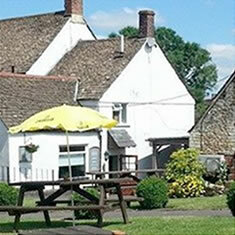 We hope you will be delighted with our quintessential Cotswold pub. Our commitment to our customers is first and foremost and as a team we strive to ensure that your experience here will be the best possible. 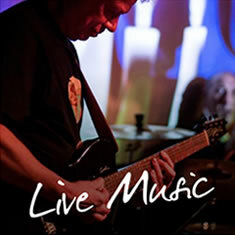 Our aim is to offer an inclusive and friendly environment to both our local community and visitors’ further afield. Whilst we welcome families we kindly request that children are supervised and respectful of the pub environment. Your four legged friends are welcome too – fresh water and dog treats are always on tap. We require dogs to be kept on a lead and clear of walkways so as not to a cause a trip hazard to other customers. We do not allow dogs in the restaurant areas. We are fortunate to be surrounded by beautiful countryside with the Cotswold Way just minutes from our doorstep. Walkers are kindly requested to leave muddy boots outside or in the porch. 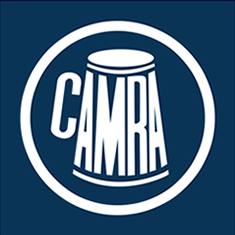 Our passion for Real Ale sits high on our priority list and is a strong contributing factor to winning the Dursley and District CAMRA pub of the year 2018 that was announced just 15 months into running the business - not a bad accolade! 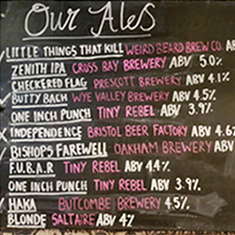 We have up to seven Real Ales available at any one time and amongst the line up are our regulars: The Wye Valley Brewery’s, Butty Bach (Welsh for ‘little friend’) and Sharps Atlantic. The remaining line up showcases some of the best ales from around the UK and we actively encourage customers to sample them – or even try a Paddle of 3 Thirds.